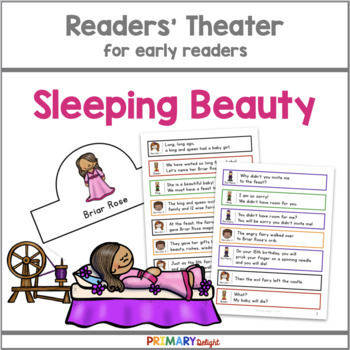 The fairy tale of Sleeping Beauty is retold as a Readers' Theater for young readers. This script is perfect for first and second grade readers! The simplified text and use of sight words make it easy to read. 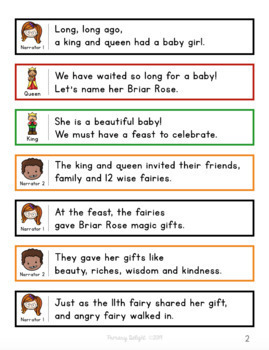 This Readers' Theater works great for shared reading or for a strategy or guided reading group focused on fluency. Each part is color-coded on the script, making it easier for young readers to follow along and identify their parts. The font is clear and easy-to-read. 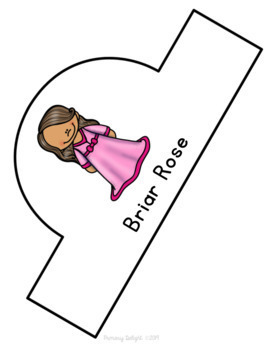 Also included are crowns for each of the characters (with a choice of a boy or girl for each narrator.) 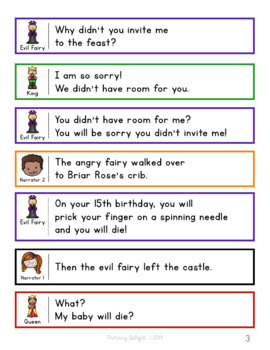 Alternately, there are small oval cards for each character that teachers may use instead. To use these scripts for partner reading or center work, bind them in a pocket folder and add the included title labels. All materials (scripts, crowns, character cards, and title labels) are included in both full color and in black-and-white. Looking for more Readers' Theaters for beginning readers? Look here!